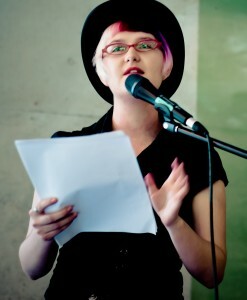 Zenobia Frost is a Brisbane-based writer and critic with a PhD in burning the candle at both ends. Since 2009, she has released two chapbooks and toured both interstate and overseas. She travelled with the 2012 Queensland Poetry Festival Regional Roadshow, before whipping a full-length manuscript into shape at Varuna, the writers’ house. Formerly the arts editor of Rave Magazine and OffStreet Press, this year Zen dedicates her editing brain to Voiceworks and Cordite Poetry Review. She is fond of strange myths, incisive verse, theatre, graveyards, and tea. Her website is zenobiafrost.wordpress.com. The current bedside pile includes Zadie Smith’s On Beauty and Julian Barnes’ Talking It Over. I’m also reading Murakami’s Dance Dance Dance, with its strange, tense mood. They’re very different books, but I’m awed by the characterisation in each; for me, good dialogue is the marker of authentic writing, and strong characters are the most important part of any narrative. I think that idea translates to poetry in different ways: often, in poetry, the object is the protagonist – e.g., place as character. I think that’s a feature of poetry, tied into metaphor, we often forget to recognise. As for poetry, I admit I stuck my fingers in my ears for a couple of months after visiting Varuna, which was such an overwhelming poetry-reading and -writing experience. These past 12 months have been, for me, the year of comics: I’ve always liked Neil Gaiman’s writing, but Sandman is the really good stuff. Graphic novels are very alive. I think we need more graphic poems. The poetry mainstay in my life is Voiceworks (that’s a cheat: I help edit it). VW Magazine reminds me that there are always fresh voices coming into writing. It changes. There are weeks when I write reams and reams of poems; there are months when I write nothing but shopping lists. Sometimes life gets in the way and I have to remind myself that writing is not just a lover-on-the-side – I have alarmed myself by how hard it can be to get going again after a break. I’ve just gone back to keeping a notebook in my handbag and another by the bed – already I’ve been writing more. I try to always write down my dreams. If I were as creatively productive during the day as I am when I sleep, I’m sure I’d have finished several novels by now. Ho hum. I would say that I have an editing practice. I spend a lot more time revising than writing new work; it’s probably an 85/15 split. If I happen to read something I’ve written, I’ll have at it immediately with the red pen. In the past I’ve found that habits like ‘writing 10 new lines / 100 new words daily’ work well for me, but I really struggle to meld my writing brain and editing brain – even though I know they’re two sides of the same coin. This is why I find it easier to finish a poem than a longer work: shorter things hurt less to revise and reprint. I feel like there should be more dialogue and collaboration between Australian page and performance poets. In some regards, it’s an arbitrary distinction – but having spent time with poets who strongly identify as from one camp or the other, I think there is a divide. For a long time I huddled with the page poets, thinking my poems weren’t suited to performance. Then I worked with some stage poets who challenged my assumptions about slam – and I learnt a lot from them. We travelled around Queensland and saw it in action: they gave performance and stage persona workshops, and I gave editing and form workshops, and we all came out the better. David Stavanger’s Page Versus Stage event at the State Library of Queensland last year made for fascinating stuff. I wish I’d seen more of them. 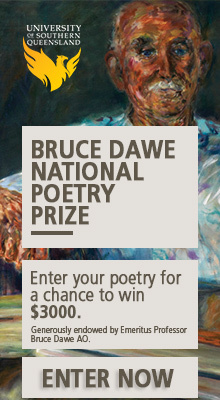 At the event I attended, we debated the limitations on ‘page’ and ‘stage’ poets – who gets published, who is eligible for prizes, grants, tours, etc. I think performance poets feel underrepresented on the page, and page poets feel unwelcome at slams. There are several questions worth asking: Should all poets embrace skills across the board? What needs to change, on both sides – or is it an imagined divide? In what ways do poetry and theatre commune? And perhaps most importantly: where are the wineglasses?